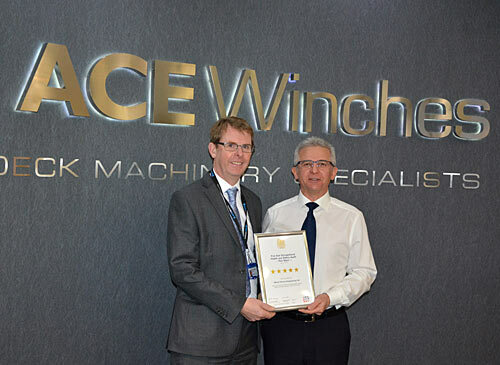 ACE Winches has announced that it has achieved a five star grading from its Five Star Occupational Health and Safety Audit conducted by the British Safety Council. ACE Winches underwent a detailed, quantified and objective evaluation of our occupational health and safety management system. The audit measured our performance against a number of key safety management indicators and achieved the highest rating. The British Safety Council’s Five Star Occupational Health and Safety Audit provides organisations with a worldwide benchmark of their safety management systems against current best practice to enable continual improvement. The Audit specification was revised in 2013 to include performance measurements in two additional safety management indicators (Leadership and Continuous Improvement) which are continually assessed, alongside other indicators, throughout the audit process. Within the revised audit, the British Safety Council has placed a greater emphasis on the organisation’s approach to occupational health, employee wellbeing, safety culture, allocation of resources to health and safety and planning for change; all of which are considered important best practice factors.